WATER RESISTANT SPEAKERS A range of water resistant speakers for panel mounting. 4 ohms are ideal for marine use. 8 ohms are suitable for PA installations such as swimming pool areas, bathrooms etc. 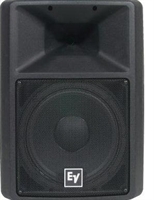 The Electro-Voice Sx300 is a 300-watt, 12-inch two-way, high-efficiency, constant-directivity compact speaker system with Ring-Mode Decoupling (RMD). ART 310 is the reference speaker in the 10” size. High quality neodymium transducers, very compact size cabinet. ART 312 is the optimum choice for live sound situations where an exceptional full range, outstanding bass reproduction and accurate high frequency delivery is required. The ART 312 is also suitable for monitoring applications. The new F-1000 and F-2000 Series speaker systems are designed to provide high quality sound and reliable performance for restaurants, retail and audio/visual applications. Integrated with speaker unit and panel, the PC-1869S Ceiling Mount Speaker is of all metallic construction and is ideal for Public address announcements and BGM. 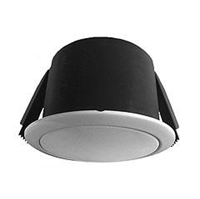 TOA's PC-1867F and PC-1867FC Ceiling Mount Speaker features an iron-made dome that prevents the fire from speading in the ceiling in case of an emergency situation.